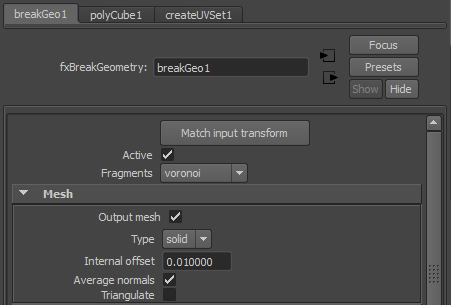 The Mesh attributes are the first set of attributes available on a break geometry node. Draws the resulting fragments. When toggled off the mesh now draws as it did prior to being fractured. Determines whether or not internal fragments will be generated. This values determines how far the internal fragments are offset from one another. Average normals will smooth the edges of the internal faces. When toggled off it produces a more chiseled affect. Triangulates the output mesh faces. This page was last modified on 6 July 2012, at 03:56.